“India lives in its villages”. Rural development is a complex process as it involves continuous reorientation and adaptation of traditional values, practices and institutions in order to incorporate increasing corpus of scientific knowledge and technologies to enhance quality of life and welfare of the people. 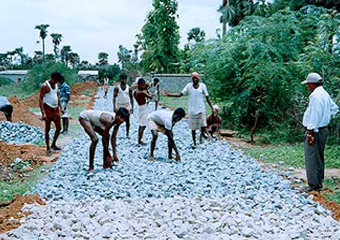 India is a land of villages and the Government of India has been implementing numerous rural development programmes for the upliftment of rural Communities. Non-government organizations with their advantage of non- rigid, locality specific, felt need based, beneficiary oriented and committed nature of service have established multitude of roles which can effect rural development. A number of NGOs have been playing a vital role in rural community development, besides government interventions. Realizing that the government alone was not able to meet the challenges of the massive enormous tasks in the process of rural development, the TBSRF involves in different phases and activities at the local levels.